Done – The Fractured Christmas Star is finally quilted and bound. 12 Days of Christmas by Kate Spain, Bella Solids and Aurifil threads. Done – The Christmas tree is up and decorated. Your star is beautiful!!! I love it:) Best, Debuko! GREAT Star…really pretty! And wunnyFULL tree. I NEED some "force"…it needs to light up under me ol' tush! I seem to be DRAGON meee feet to get up Christmas decorations. The fractured Christmas star is gorgeous! Love the star – and those roos!but shouldnt they be snow white boomers?! The star is gorgeous and your tree looks wonderful! Hey, that star is really neat!! Your star quilt looks amazing! Gorgeous Star!! 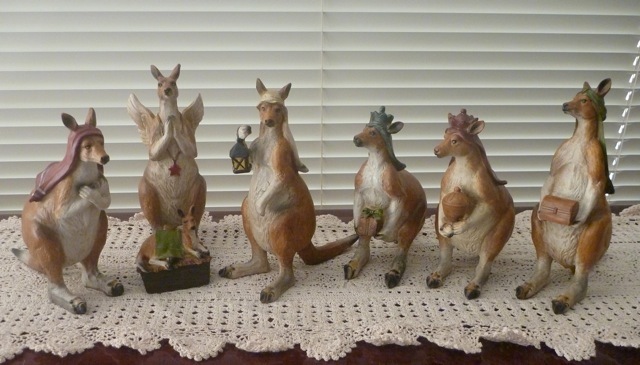 I love your aussie nativity- talk about original. Your are looking very festive. Jane I love your wall hanging, looks great. Can you tell me where you bought the little hooks? I Love the Aussie Nativity! So cute. I just adore your Fractured Star.